eTrack’s Document and File Management module is a fully featured product in itself providing a holistic view of all your project files and all quality documents. Search across millions of documents, create your own from templates and include them in emails and transmittals. Single repository of all documents that all staff can access. Index your existing file server creating a holistic view of all directories and files. 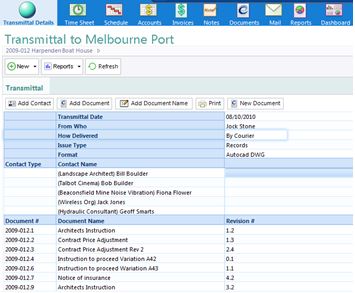 Create documents from templates and auto populate fields and reports from eTrack. Use your existing Microsoft Word templates or use eTrack’s built in Word editor. Quickly search across millions of files and perform complex queries by project, contact, author, date, revision, name, type etc. Email documents with auto filing. Export multiple documents and optionally compress to a zip file. 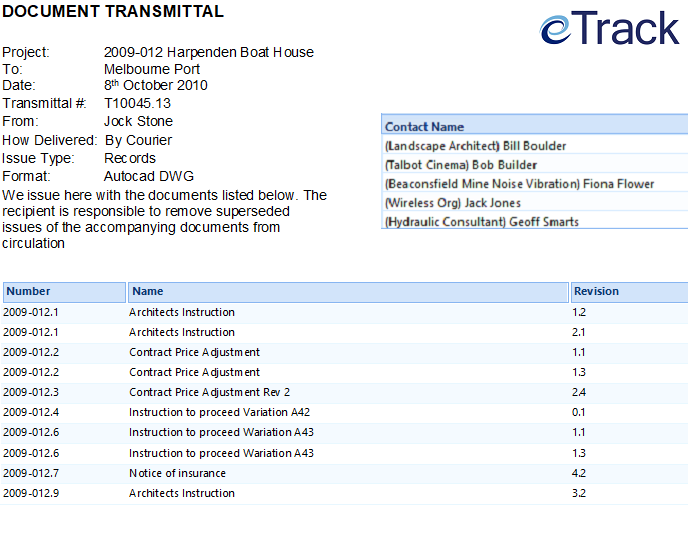 Whatever you search for in the eTrack tree you can view the associated documents. For example all documents to do with a Client, Project, Consultant, Council, Individual or Staff member. You can further filter and sort the documents by type, author, creation date etc. 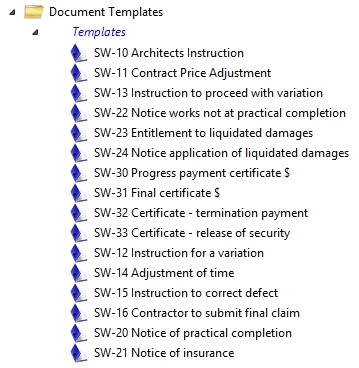 Documents are typically created from pre-defined templates, with fields automatically populated from eTrack. You can select from hundreds of templates organised into groups. Template documents can be created using eTrack’s build-in Word editor and ‘mail merge’ fields added using a clever user friendly utility. Any field from the database can be inserted plus reports and graphs. Documents created from embedded templates are stored in the eTrack database and can be exported as .doc, .docx or.PDF files etc. Alternatively, which is popular, use your existing Microsoft Word, Excel and Powerpoint template documents and type in ##tags to represent eTrack fields to insert. When a Document is created a copy is made on the file server and the newly created document in eTrack is linked to the copied file on the file server. When a file is opened, the program relevant to its extension is launched to edit it. 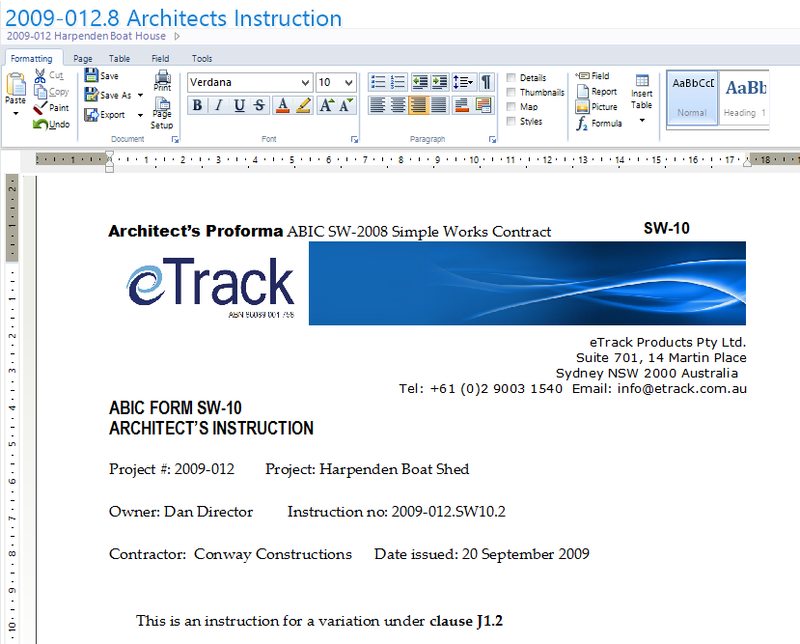 eTrack supports MS Word template formats: .doc .docx .dot .dotx and the equivalent for Excel and Powerpoint. Revision Management. This applies to internally created documents and externally linked files where the last characters of the filename are changed. Quickly create a PDF of a Document or File. Export multiple embedded documents to a directory. Export Documents to a compressed ‘zip’ file. Create a Document Group by simply dragging one Document onto another. An important benefit of eTrack is that it indexes your existing folders and files on your file server and stores meta data in eTrack. eTrack does not touch your files and you can still access them on the file server directly. When adding a project, folders can be created on your file server depending on the project template selected. Existing files can also be attached and managed in the same way as internally created documents. eTrack has a ‘Document Link’ utility that iterates over all your project files nightly updating the index and meta data stored in eTrack. An eTrack Transmittal is a collection of documents of particular revisions distributed to selected contacts. Each project has a register of Transmittals that may be sorted, filtered, grouped, printed and exported. The fields in the Transmittal register can be configured using the built-in report writer. Clicking on a row in the Transmittal register or clicking New will display the Transmittal. Any embedded Document or external file may be added by dragging it from the eTrack tree or doing a search, or all documents within a folder added in one go. 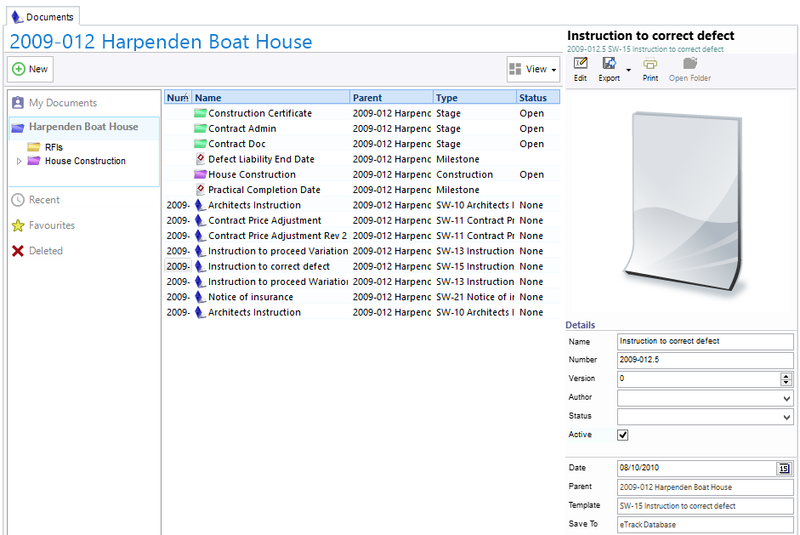 The revision is automatically populated and Contacts are added in a similar way. The Transmittal may be edited, printed and emailed. Emailing a Transmittal will auto populate the emails of the distribution list and attach the files, optionally as PDFs. eTrack currently doesn’t combine files to one PDF but this is being researched. Also being worked on is the ability to send zipped Documents by reference, such as by dropbox, googledrive or ftp for example.